Photo 4 (above). The Early to Mid-Ordovician (Llandeilian/Llanvirn age) rocks (right foreground) exposed at Pen y Craig, in the central Berwyn Mountains, consist of calcareous tuffs, impure limestones and calcareous mudstones. 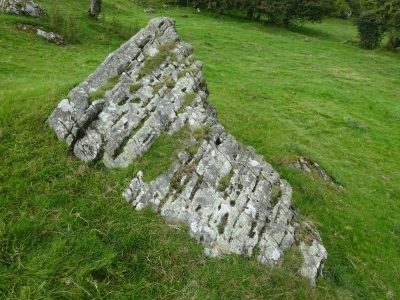 They form the oldest and deepest rocks in the Berwyn Mountains, but why are they exposed here at this location, and also at 2 other locations along a south-westerly trending belt in the central Berwyn Mountains? (see geological map, back page). Geological field work over many decades suggests that a complex interaction of faulting, folding, uplift, and deep erosion, probably revealed this series of small erosional ‘windows’ or ‘inliers’, which now expose the deepest, and oldest, rocks within the core of the Berwyn Mountain, beneath the overlying and slightly younger Llangynog Formation mudstones. Visit the Geoscience Wales website page (www.geoscience-wales.co.uk) to see how this probably occurred. 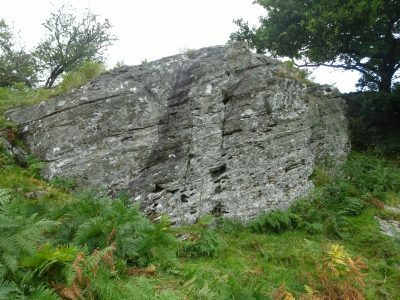 Photos 5 and 6, (above and right) show two views of the strikingly different rocks revealed in the Pen-y-Graig inlier, which consist of impure limestones, as seen here, along with calcareous volcanic tuffs and calcareous mudstones. These pale grey to white limestones contrast markedly with the dark grey, laminated mudstones of the Llangynog Formation, which surround and cover them elsewhere in the Berwyn Hills.